"It's one thing to play a hero in a movie, it's quite another to be one in real life" states Bill Paxton as he describes decorated retired NAVY Seal Marcus Luttrell at last night's memorable TEXAS HONORS event. 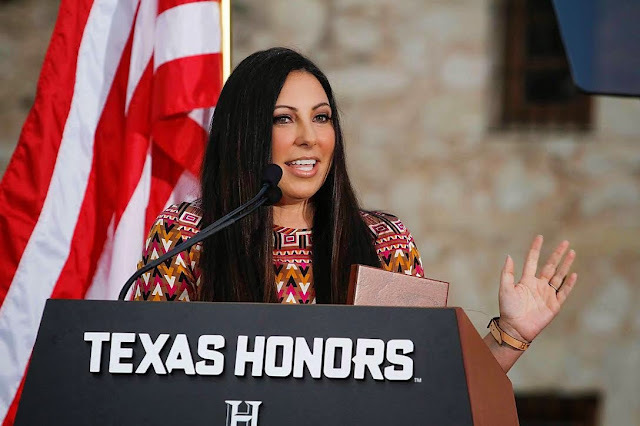 The legendary evening, which took place outside the Alamo, not only celebrated the premiere of HISTORY''s new epic miniseries TEXAS RISING (airing Memorial Day- May 25 at 9pm), but honored some of Texas' most distinguished leaders. The evening also kicked off fundraising efforts for the Alamo Endowment, honoring the state's great history in partnership with Texas Governor Greg Abbott and Texas Land Commissioner George P. Bush. Presented by TEXAS RISING star Bill Paxton, Melanie Luttrell accepted Marcus' award on his behalf as he was honored for his dedication and commitment not only to Texas, but to the United States. A video segment was played at the ceremony featuring Marcus displaying his pride for his nation and his home state of Texas.